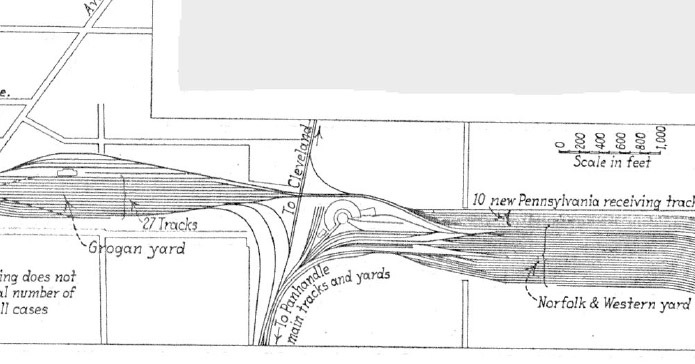 The drawing, taken from a 1931 Railway Age magazine, shows Grogan Yard on the left, the N&W Joyce Avenue Yard on the right and the Cleveland Akron & Columbus mainline running northward in the middle just to the west of the N&W roundhouse. The ten track Pennor Yard is on the north side of the N&W yard. To see a more detailed view of this map click on the map. This series of photos were taken between Grogan Yard and Pennor Yard showing coal trains being transferred from Pennor to Grogan and in at least one case leaving for the Sandusky docks on Lake Eire. Coal would come from the south on the Norfolk and Western. In 1930 when the N&W expanded their Joyce Avenue yard the PRR built the 10 track Pennor Yard on the north side of the N&W yard. The west end of the yard throat led to a crossing of the PRR's CA&C and to the east throat of Grogan yard. The N&W would leave the coal cars in Pennor Yard. Sometimes the PRR would pull them into Grogan for staging and sometimes it would just couple on the road engines and head for Sandusky as the photos will show. From Grogan Yard there was a .3% grade as far as Lewis Center about 15 miles north. A helper engine would be added to the front of the train, usually a J1, 2-10-4. At Lewis Center the train would stop, the helper cutoff and cross over to the southbound track. It would back all the way to Grogan Yard ready to help the next northbound coal drag. The slide show photos are taken around the N&W roundhouse between Grogan and Pennor Yards by Donald A. Kaiser, April and September 1955.